The launch of the General Comment on Adolescents in Geneva and Brussels this week is the most important articulation of adolescent rights since the UN Convention on the Rights of the Child in 1989. Adolescence, defined as “a life stage characterised by growing opportunities, capacities, aspirations, energy and creativity, but also significant vulnerability” is an increasing focus area for the rights and development community, and poses opportunities and challenges for child and youth policy-makers alike. Alex Farrow, from our team, speaks at the launch event in Geneva. 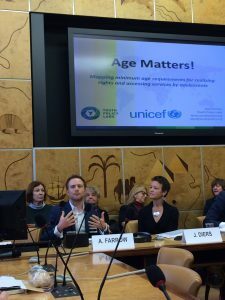 The General Comment on Adolescents (GC20) was finalised in September 2016, and was the subject of two launch events at the Palais de Nations in Geneva, and in Brussels this week. As Benyam Dawit Mezmur, Chairperson of the Committee on the Rights of the Child (CRC), noted at the Geneva launch: “The Convention is, by definition, an age-based Convention.” But while the Convention formally relates to those up to the age of 18 years, it is used as an advocacy tool for young people generally, those advocating and defending youth rights, and those conducting research – especially in the field of youth participation. Age is a crucial aspect of this debate, and the reason for our involvement in the launch events. Do you remember the last time you were denied something because of your age? For most, your 18th birthday gives you the ability – within the law – to do things for yourself. To choose, to act, to be autonomous. This is not the reality for adolescents. It is difficult to imagine a time of life when – purely based on age – so many laws dictate what you can, can’t, and require permission to do. The GC20 attempts to bring visibility to the age of adolescence – still a contentious and undefined life stage – which remains a squeezed period of life; not child, not youth, and rarely considered in either national policies. Except in one domain: when it comes to juvenile justice, adolescents feature prominently given that this life stage spans the period when children become criminally responsible. Within UNICEF, adolescence has become an emerging issue as part of their focus on the “second decade”. While UNICEF is traditionally known for their work on early childhood, their logic with this shift is clear: there is no point in keeping children alive until they are 10 years, only to abandon them in their adolescence. The area of minimum-age legislation is receiving renewed attention: CRIN launched their notable paper, Age is Arbitrary in 2015; the EU’s Fundamental Rights Agency have undertaken a large-scale mapping of age-relation legislation across the EU – as have UNICEF Regional Offices in Latin America and Eastern Europe & Central Asia. The GC20 takes us to the next level in the discussion on the ages that adolescents should be able to make independent choices, access services, and realise their rights. It makes clear recommendations in three areas: increasing the minimum age to 18 years; the setting of ages based on national context; the removal of any age restriction. States should set an age according to national context: Consent to adoption, change of name, applications to family courts (Art 39); access to sexual and reproductive health services (Art 39); sexual consent (Art 40); the right to work, excluding hazardous work & must not interfere with schooling (Art 85). States should remove age-related requirements: Consent to medical treatment (Art 39); access to confidential medical counselling (Art 39); sexual and reproductive health service (Art 61). Minimum ages are often a balance between protection and participation. How do you empower adolescents to make independent choices, while simultaneously ensuring they benefit from the protections afforded to them by virtue of their young years? However, many areas are neither; they are politics. Under the guise of protection or participation, adolescents are frequently subject to adult politics: religious influence that allows child marriages; national security threats which allow adolescents to held, tried and incarcerated; an economic reality that forces adolescents out to work instead of in school. While the GC20 takes numerous positions on minimum ages, some in the child right’s community would go further: CRIN, for example, would advocate the removal of age limits entirely in some areas and would favour more emphasis on the capacity of the child in determining when a adolescent can make decisions or choices. A more extensive look at the debate on minimum ages can be seen in our working paper on age-related barriers. Our research with UNICEF CEE/CIS, Age Matters!, has focused on minimum-age requirements across the Eastern Europe and Central Asia region. While in many areas States are in line with the GC20 recommendations, there are legal inconsistencies, vast exceptions, and bizarre legislative realities: when a child is responsible for a crime, but cannot make a complain themselves in court; when there is a low age of consent for adopt, but a high age of consent for medical treatment; when an adolescent can be married from as young as 14 years, but cannot access independent, confidential medical advice until 18 years. You can read our full research report, our working paper, and visit our interactive data site here: www.agemattersnow.org. The Committee emphasizes the rights of all adolescents to freedom of expression and respect for their physical and psychological integrity, gender identity and emerging autonomy. It condemns the imposition of so-called “treatments” to try to change sexual orientation and forced surgeries or treatments on intersex adolescents. We welcome this statement from the Committee. It cannot have been easy to agree – especially given that homosexuality remains illegal in 73 UN Member States – but we are thankful to the Committee for standing firm and facilitating delicately this long-standing human rights abuse. Along with specific focus on girls, those with disabilities, minorities and indigenous adolescents, the GC20 takes a significant step forward in ensuring the Convention on the Rights of the Child remains evolving, relevant and credible as we approach its 30th anniversary. When it comes to adolescents, age matters. It matters because when young people are refused services, denied a choice on a matter affecting them, and unable to claim their rights, their wellbeing is – at best – restricted, but at worst, jeopardised. The GC20 was written and agreed by the Committee on the Rights of the Child, and while it is not legally binding on States, the process of development has ensured it has been rigorously debated, with every word agreed upon. But now the focus is on States to implement, the CRC to monitor, and the UN to champion stronger rights for all adolescents and youth. We repeat our call for an International Youth Rights Convention. There is clear overlap between the rights of children, adolescents and youth, but this needs a stronger and wider articulation than the General Comment can provide. This isn’t just about laws, but laws are a good place to start. Written and researched by Alex Farrow and edited by Cristina Bacalso.